Ace tennis player Sania Mirza and her cricketer hubby, Shoaib Malik recently welcomed their little bundle of joy and named him Izhaan. In fact, their baby announcement was also adorable where they had dedicated a separate locker for their baby. While we thought it couldn’t get any better, new mom Sania had posted a heartfelt note about how parenthood feels like “the biggest match, tournament or achievement” she had ever won and it was endearing in more ways than one. Since then, Sania has been sharing a few glimpses of their munchkin here and there and it has been everyone’s fix! If you haven’t figured it yet, we have a new batch of pictures of the mom and kid duo and per usual, we are here to share. The shutterbugs caught them at the airport today and it’s a treat for sore eyes. 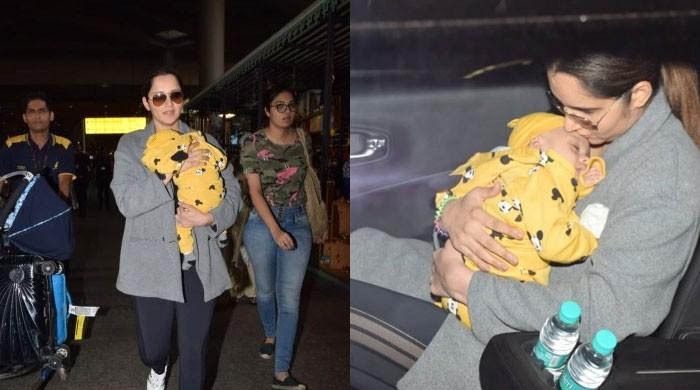 While she was seen wearing sweats and an over-sized coat, the little champ was all bundled up in a Mickey Mouse yellow jumper hoodie.